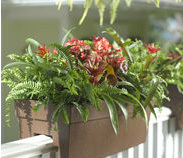 Surround your balcony, porch or deck with a border of flowers and foliage! Deck railing planters increase your gardening area along the length or in corners of decks or balconies. Railing planters are available in a variety of sizes and styles which either sit on top of the railing or rest in brackets mounted on railings. 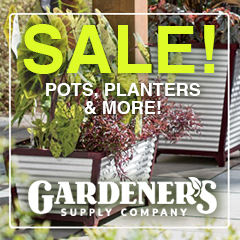 In addition, you can choose styles to plant directly into or to place planted pots inside. 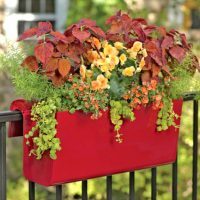 Planters for deck railings often come as kits which include mounting hardware or brackets. Before shopping for your deck planters, be sure to measure the length of open railing space, allowing for any fixtures or gates, and the width of the railing top. Also it is very important to ensure the railing you intend to mount your planters on is very secure and stable. Deck railing planters can get heavy, especially after watering—so make sure your railings will safely support them.